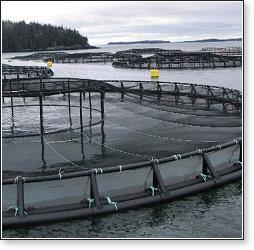 Fish farming ("aquaculture") has resulted in devastating consequences for the fish populations subjected to farming, and it negatively impacts wild fish populations. The ethical and health issues inherent in the factory farming system exist in the fish farming system, with no laws regulating humane fish slaughter. Far from being unintelligent, fish are, in fact, able to form relationships and hierarchies with one another and to recognize one another as individuals.14 Additionally, fish are able to use tools and act in cooperation with other marine species. They have been shown to have significant long-term memories and are able to pass information along to one another through social networks, both inter-and intra-generationally.15 Most important, "research shows that fish respond to painful stimuli in a manner that is not just a simple reflex. "16 Fish have been shown to experience pain and fear, and yet are killed in a manner that "meet[s] no standard of humane slaughter. "17 The ways in which fish are killed, in fact, often prolongs their pain and suffering. 1 Fen Montaigne, "Global Fisheries Crisis," National Geographic magazine, April 2007. 3 "Fishing in Israel," Wikipedia, March 2014. 4 A Mood and P Brooke, "Estimating the Number of Fish Caught in Global Fishing Each Year," fishcount.org.uk, July 2010. 5 Jonathan Safran Foer, Eating Animals. Little, Brown and Company, 2009. 190. 6 Mood and Brooke, "Estimating the Number of Fish Caught." 7 Foer, Eating Animals, 189–190. 8 Foer, Eating Animals, 190. 9 Mood and Brooke, "Estimating the Number of Fish Caught." 11 "Farmed Salmon," World Wildlife Fund. 12 Mood and Brooke, "Estimating the Number of Fish Caught." 13 "Farmed Salmon," World Wildlife Fund. 16 Temple Grandin, Improving Animal Welfare, CAB International, Cambridge, MA, 2010. 17 Mood and Brooke, "Estimating the Number of Fish Caught."